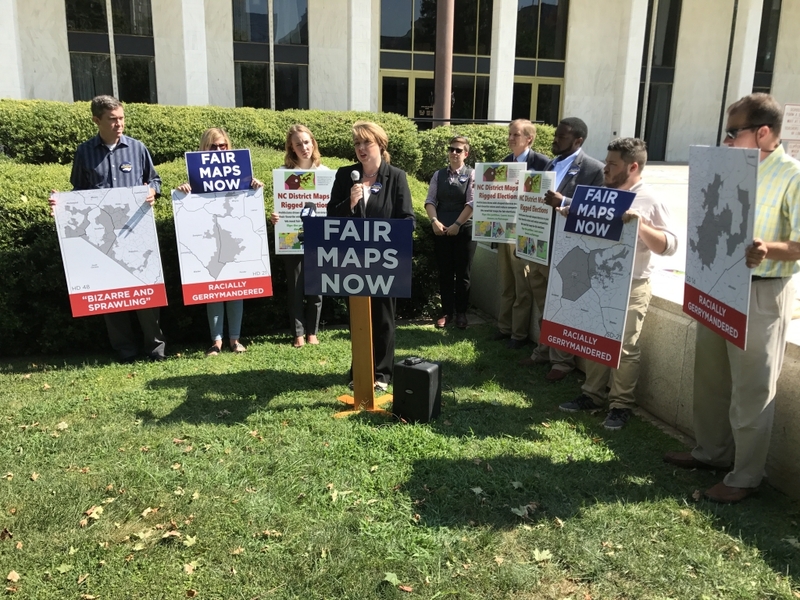 Just three hours before lawmakers were set to attend a joint redistricting committee meeting, voting rights advocates gathered outside the legislature to call for fair maps. “It’s been almost two months, enough is enough,” said Melissa Price Kromm, Director of NC Voters for Clean Elections. She was joined by Marcus Bass from Democracy NC, Bob Phillips from Common Cause NC and Sarah Gillooly from the ACLU of North Carolina. They all called on legislators to draw fair maps using a fair process without political or racial gerrymandering. Bass noted that a recent poll showed that voters across the political spectrum want a system that is designed to listen to them and value their vote — something they aren’t getting with a gerrymandered system. Similarly, Gillooly talked about how gerrymandering makes some votes count more than others which is opposite of the one person, one vote principle. “Our government derives its power from we the people and must be accountable to we the people but at the hands of partisan politicians, we have strayed from these core principles in North Carolina,” she said. The redistricting committee meeting is set to begin at 1:30 p.m. today, although it’s not expected that lawmakers will begin the drawing process. The meeting will be held in room 643 of the Legislative Office Building. An audio stream will be available here.